When the 62nd Annual Chevrolet Performance U.S. Nationals roll around at the end of the month, most Aussie fans will be looking for names like Richie Crampton, Wayne Newby and Shane Tucker. While we’ll all be cheering them on, keep an eye out for Mathew Leonard in Competition Eliminator. Mathew and brother Warren have been involved in drag racing since they were both a few months old. Their father, Len Leonard, is one of the early pioneers of drag racing in Australia. Their mum, Jan, has even dabbled in driving a few drag cars herself. Mathew has a blown hemi Comp Altered he competes with in the USA and Warren has a blown hemi front engine dragster competing in Supercharged Outlaws. “The bug bit us both early on when the family would race our multitude of race cars across Australia and we both honed some of their skills working at the family race shop in Adelaide (OG Speed Shop), says Mathew. Mathew joined fellow Adelaide boy, Robert Schwab, in Elko, Nevada to race Robert’s Alcohol Funny Car on the CIFCA circuit. Towards the end of the season a trip back east to Indianapolis was planned for the biggest drag race event in the world. With this in mind Mathew flew to his first ever NHRA National event, the U.S. Nationals to witness the iconic event firsthand. 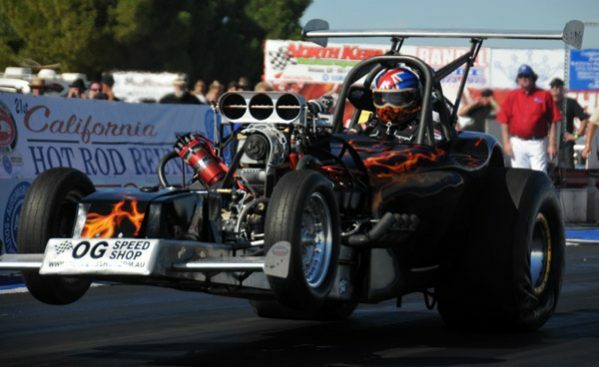 After watching fellow Aussies John Hoskins and Phil (Bluey) Howard race their Top Fuel bike, he knew that the U.S. Nationals was now on his bucket list of events to compete. “I returned back to Australia and continued to race with the family and several other teams with the intent to eventually get back to the USA. “The year 1999 was full of a lot of memories. From debuting Robert’s new Nitro Funny car and then building a second one, to meeting his future wife to be (Lisa), to managing the Cowin Top Fuel Drag Racing Team, setting world records and running on the NHRA Pro Tour till the end of 2001. At the end of 2002, Mathew decided it was time to spend more time with his wife, start a family (daughter Gemma); and design, engineer, build, tune, fund, and of course drive the NitroRat Altered all with one of the many goals in mind which was to race at the U.S. Nationals. This year marks the 20th anniversary of his first ever U.S. Nationals and there is no better way to go racing than to have Warren and Jane (sister in-law) fly out and fulfill more goals of the brothers running at The Big Go. The qualifying times for Comeptition Eliminator on Thursday September 1st are 1:30pm and 4:30pm, Friday September 2nd aat 2:30pm and 5:15pm with Round 1 of racing on Saturday September 3rd at 11:15am. All times are USA east coast, 4:30pm Thursday US will be 8:30am on Friday in Australia. You can cheer on Mathew and all of the Aussies competing live on www.nhraallaccess.com. Mathew will be posting updates on his NitroRat Racing Facebook page and further updates will be available in the Aussies Abroad wrap up here at ANDRA.com.au following the completion of the event.